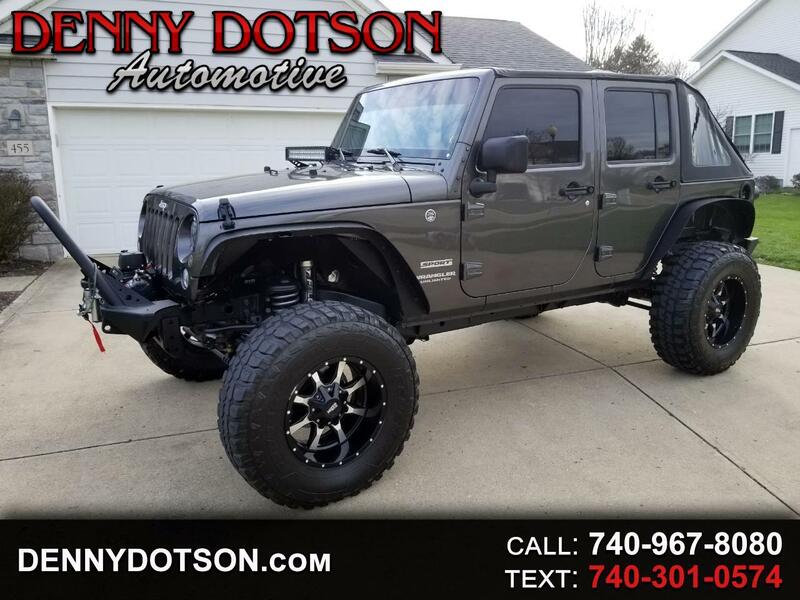 Used 2017 Jeep Wrangler Unlimited Sport 4x4 for Sale in Johnstown OH 43031 Denny Dotson Automotive Inc.
All of the right money has been spent here. Teraflex suspension lift/Falcon Sport Series 2 shocks, Poison rear bumper, Poison spare tire eliminator, Slantback top, 18" Moto Metal wheels.37X12.5 tires, Rough Country 2.2 Stabilizer bar, Smittybuilt front bumper, Smittybuilt RC 9500 Winch, XRC Metal inner fender liners, all LED lighting, and numerous other refinements. Clean history with accidents or issues. Drives as straight as they come(no wobble or loose front end). Compliments everywhere it goes!! Ultra clean in all the places that are impossible to get clean if it has spent to much time in the mud. The light bar is screwed into the factory holes for the windshield and can be removed easily and look like it was never there. No way to build it for this price.